Beautiful picture of the backyard of Villa Breezy Palms. Front elevation of Villa Breezy Palms. Screend front door lanai entrance. High ceilings and lots of natural light due to the large windows. The den features a comfortable couch and coffee table. A nice relaxing area features a couch and table. The main living room features a sofa, reclining chair, as well as a large entertainment center featuring a flat screen TV. Open floor plan at Villa Breezy Palms. View from the front door to the main living room and lanai. The living room features a large sliding glass door that leads out to the lanai. The dining nook is located next to the kitchen. Dining nook overlooking the swimming pool and lanai. Breakfast bar with bar stools. Large kitchen that is open to the living room. Kitchen featuring black granite counter tops. Large under truss sitting area with comfortable seating. Dining table with a view on the lanai. The pool area features chaise lounges, side tables as well as an umbrella. The swimming pool is solar and electrically heated. Large dock for fishing and relaxing is available. This guest bedroom features a queen size bed. View out to the lanai from this good sized guest bedroom. The guest bathroom offers dual sinks, toilet as well as a tub/shower combo. The second guest room also has a queen size bed. Queen size bed and a large dresser for storage. The master bedroom has a large sliding glass door that leads out to the pool deck. King size bed in the master bedroom and direct access to the en suite bathroom. Flat screen TV is provided. Master bedroom with its king size bed. Dual sinks, soaking tub and walk in shower as well as a separate toilet in the master bathroom. Master bathroom vanity. Free form swimming pool electrically and solar heated. Large pool area for relaxing and sun bathing. Rear elevation of the property Breezy Palms. Breezy Palms is located in NW Cape Coral, 3 bedrooms, 2 full baths, plus Den are available for you, high ceilings and an open floor plan with split bedrooms, breathtaking views of the 200 + ft. wide "Alligator Slough Canal" make this property very unique, large under truss sitting area with electric heated swimming pool, concrete dock by the water with a wooden boat dock, secluded and very private backyard, no immediate neighbors and none across the very wide canal, very tastefully decorated, kitchen equipped with stainless steel appliances, copper sink and granite counter top. 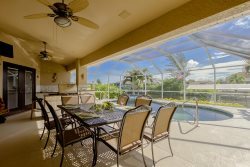 Villa Breezy Palms liegt im NW von Cape Coral, 3 Schlafzimmer &amp; 2 Baeder stehen zur Verfuegung, hohe Decken, gerauemiges Wohnzimmer und komplett ausgestatteter Kueche, Granit Arbeitsflaeche, Kuechengeraete sind aus Edelstahl, Waschbecken aus Kupfer, Gaestezimmer sind mit jeweils einem Queen Size Bett bestueckt, das Master Schlafzimmer bietet genuegend Platz mit einem King Size Bett, der Swimming Pool ist elektrisch beheizt und von der Terrasse hat man einen tollen Blick auf den sehr breiten "Alligator Slough Kanal", sehr Privat -- keine Nachbarn auf der anderen Kanal Seite, Beton Dock sowie Bootsanleger sind vorhanden. Rudy was a pleasure to work with and have a nice converstaion with. Vesteva was great as mentioned above. Family business and they treat all customers as family. They were very concerned you enjoyed your stay at your rental house. Breezy Palms was such a great place with the privacy needed when on vacation. We are renting again next year, and for a longer stay. The entire team from the people I spoke to on the phone while booking the property to the people who showed up at the property for check-in and check-out inspections were all extremely nice and helpful. My husband and I and our kids stayed for a week and we could not have been happier. The house was nice and very clean. For the most part it had everything we needed. If I had to make one complaint it would be that the lights inside the pool were not working. So once it got dark it was difficult to see the pool and the kids swimming. But in the long run that did not take away from our experience. Plus they had someone out there to fix the lights when we were checking out. So overall I would still rate our experience 5 stars and we plan on using Vesteva every time we visit from now on. Very clean place. Amazing dock area. Enjoyed our Florida stay. Vesteva was an overall positive experience. Phone calls to Vanessa were answered immediately, and what a pleasure meeting and visiting with Rudy. Rudy was full of information and such a nice gentleman. Wish I could have stayed for another month! EXCELLENT! Thank You!!!! We scheduled Breezy Palms while evacuating from Hurricane Matthew and the process was extremely efficient and the host returned our inquiry immediately. Many of our friends were unable to book hotels, at VBRO and AirBnB - however, we found Vesteva in the nick of time and extremely thankful for such speedy communication. Very clean and quiet. What Le Anna thought you could improve about the experience: Nothing! They were friendly and willing to help. The house was very comfortable and sufficiently furnished without being cluttered, and the separate sleeping areas were perfect -- our 2-year-old could easily sleep while others were in the pool, those who woke early could make breakfast without waking the others... a great experience. Also reasonably close to all the essentials! We had such a great time at this house! It was exactly like in pictures and had everything we would need for a perfect vacation! There were beach supplies in a garage and board games in a closet for the evening! Our kids loved the pool! Beds were very comfortable and there are plenty of towels and extra bedding if needed. Publix is just few minutes away and there are restaurants, Starbucks and gas stations all within 10-15 minutes of easy drive. Overall we had an amazing time and would recommend this home to anyone! First of all, our family had an absolute wonderful time! We didn't want to go back home. Rudy met with us shortly after we arrived. He was extremely welcoming and accommodating! The whole team was friendly and helpful. Rudy was terrific! The house is beautiful! It is so spacious, clean and up to date. We enjoyed the pool, lanai and the docks overlooking the canal. My four teenagers were impressed!! Thank you so much!! I had a very positive experience with the Vesteva Group. Every query was answered immediately. Any calls for service were immediately attended to. All the information on properties for next year was provided quickly, the information and pictures were complete. This house, Breezy Palms, was a new listing and I was pleasantly surprised to find the home equipped with new dishes and cookware, ample cutlery, glasses. It was immaculately clean. Most years I have had to do some cleaning on arrival when I booked with other agencies. And best of all was the experience of the party for all the guests. We had so much fun meeting people. Our hosts, Eva and Ruedi, were so attentive and kind, the whole family treated us as old friends. It was lovely. I have booked for the next two years with this agency. This was a last minute find for us. We lost the house we were renting and Eva was one of the many agents I called trying to find another. At first there was nothing available until Eva called and said she had a new listing, was I still looking. It turned out to be a great experience all around. We thought that perhaps the place was a little to far north but that turned out not to be the case. It was quiet, opening the front door which was screened in allowed for a beautiful cross breeze through the house all day. No need for any air conditioning, that was great. We had a very relaxing stay in 2015. Thanks to the Vesteva Group.